“Off with our heads!” Recuperation and the politics of childcare | Laney College student unity & power. Abel Guillen, incumbent Chair of the Peralta District Board of Trustees, is re-writing history. Guillen is running unopposed for his seat, and few people would bother to look at his campaign web site even if his name appeared on the ballot. But we took a look. Like virtually everything written by the District and the Board of Trustees about the College of Alameda Children’s Center’s “budget crisis,” Guillen’s “issue” statement on the center (below) is filled with half-truths and misinformation. Guillen says earlier this year, the District “was considering consolidating the College of Alameda Children’s Center…to reduce operational costs.” On January 26, then-Vice Chancellor for Educational Services Wise Allen read from a memo dated Jan. 19 to announce that as of July 1, the District would close the COA Children’s Center but “serve the same number of children (120) at the two” remaining sites and eliminate eight of the 26.5 full-time equivalent positions of childcare workers. Maybe because the item was listed as an “informational item” under “Enrollment, Website, Financial Aid, and Childcare Updates” on the agenda, only reporter Reginald James immediately took notice and understood the impact of Allen’s announcement as “another obstacle in the path towards education” for parents. Most COA parents with kids enrolled at the center discovered they were losing their child care when the Oakland Tribune published an article announcing the closure on March 11. The parents had no formal organization or means of meeting together beyond brief greetings when dropping off or picking up their kids. But within a day or two the Tribune article was photocopied and left at the front desk for parents to read and discuss. On March 19, the agenda for the March 23 Board of Trustees meeting was released, including layoff notices for 7.75 full-time equivalent positions: five child care assistants, a clerical assistant, a cook and a coordinator. Unlike Allen’s previous announcement, it was the responsibility of Guillen’s Board to hold a public hearing and approve the layoffs. 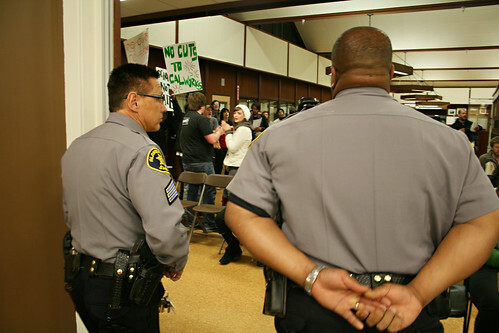 This began a series of combative Peralta Board meetings led by self-organized, multi-ethnic, working-class mothers, rank-and-file childcare workers and a lot of angry students. When we showed up on March 23 to plead with Guillen and his Board not to lay off the 8 childcare positions, he responded with the usual laments over how difficult his position is – and then voted to lay off the workers. We told him there were more options than shutting down the center and firing the childcare workers, but he didn’t act. Guillen supposes that it is his leadership that listened to the parents’ “concerns” and oversaw “successful negotiations with our labor partners.” For months, COA parents loudly and clearly demanded that their center stay open at full capacity and that the District value childcare as central to the mission of any community college. But they also demanded that their ideas be given an opportunity to be heard by the men in the District office who had unilaterally closed their center without their knowledge or participation. And yet Guillen directed the District to find the money to keep the COA center open. There are three reasons. One: It’s an election year, and it’s not good publicity to surprise a group of parents with the closure of their kids’ daycare center. Two: SEIU 1021 agreed to a fairly significant concession in order to keep the childcare budget solvent. For the Summer session, childcare workers would be paid at the hourly, not salary, pay schedule; in return, the District rescinded the layoff notices to eight childcare workers. The agreement only holds until the end of the Fall 2010 semester, but the District wants to make it permanent. Three: The self-activity of COA parents changed history. No one, least of all Guillen, planned for the strength of their unity and determination to fight for their own interests. The College of Alameda Children’s Center program provides a friendly and responsive environment for children of students, staff and community members to grow and learn. The District was considering consolidating the College of Alameda Children’s Center with the Children’s Center at Laney College to reduce operational costs.